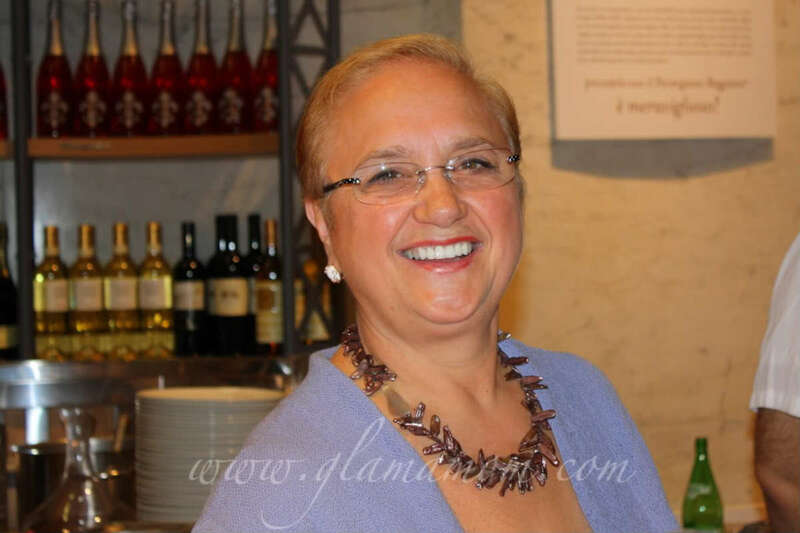 TV food personality, author, and restaurateur Lidia Bastianich, along with her son Joe and his longtime restaurant partner, celebrity chef Mario Batali, teamed up with Oscar Farinetti, to open Eataly New York, a 50,000 square-foot Italian market, devoted to the food and culinary traditions of Italy. The emporium opened earlier this month in the Flatiron District of Manhattan on 23rd Street and Fifth Avenue, across from Madison Square Park. I couldn&apos;t wait to check out the new market since I&apos;m a big fan of both Batali&apos;s and Bastianich&apos;s restaurants. Big Bub and I popped in on opening day but were forced to retreat without a single morsel due to the overzealous crowd. We tried again today and were surprised and excited to meet Lidia while she greeted customers and served her Risotto Al Barolo. She even shared the recipe. Eataly sells it for $12/bowl so this recipe has some serious value! This risotto is typical of the cooking of the Piemonte- a region where good red wine abounds and rice is king; their marriage is a natural. Any good wine can be used to make the risotto, but I prefer Barolo- in the "tradizione Piedmonstese." In a heavy, wide 3- to 4- quart casserole or pot, heat the olive oil over medium heat. Add the onions and shallots and cook them until golden, stirring often, about 8 minutes. Add the rice and stir to coat with the oil. Toast the rice until the edges become translucent, 1 to 2 minutes. Pour in 1/2 cup of the wine and stir well until all the wine is absorbed, about 4 minutes. Repeat with the remaining wine in half cup batches. Add 1/2 cup of the hot stock and the salt. Cook, stirring constantly, until all the stock has been absorbed. Continue to add hot stock in small batches- just enough to completely moisten the rice- and cook until each successive batch has been absorbed. Stir constantly and adjust the level of heat so the rice is simmering very gently while adding the stock until the rice mixture is creamy but al dente. This will take 16 to 20 minutes, from the time the wine was added. Remove the casserole from the heat. Beat in the butter first until completely melted, then half the grated Parmigiano and Castelmagno cheeses. Adjust the seasoning with salt, if necessary, and pepper. To serve, spoon the risotto into six warm shallow bowls. Top each serving with additional grated cheese to taste. Serve immediately. Risotto is the perfect fall food! If you&apos;re in the area, I highly recommend stopping by to check out Eataly. A 50,000 square foot Italian market is no small feat in NYC.